Gonzo Anthropologist: Paulina Borsook stalks the wild nerd. "Technolibertarianism is more of a religion than anything else," she says. Borsook talks like she writes, at cyberspeed, splicing adjectives together with hyphens and slashes. Her book, Cyberselfish: A Critical Romp Through the Terribly Libertarian Culture of High Tech, is a ranting, poetic, extended essay on the brave new subculture that has grown up around Silicon Valley. She paints a picture in which a horrifying lack of basic humanity and charity pervades what is quickly becoming the new world order. Borsook has been knocking around high tech since the early 1980s, writing for every technology magazine you've ever heard of and some you haven't. 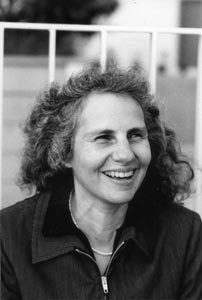 Her fiction, essays, humor pieces and journalism have also appeared in Newsweek, Mother Jones and Salon. But it wasn't until she started writing regularly for Wired that she sensed that something was terribly amiss. "I would see the kind of stuff that I've described in the book, but I didn't know what I was seeing," she says. "I'd just go, 'There's that again! What is that?' It took me about a year and a half to realize it was a libertarian propaganda rag." Like many "liberal arts flakes" bumming around the Bay Area in the 1980s, Borsook "kind of fell into high tech because that's where the jobs were." She had studied psycholinguistics and philosophy at UC&-Berkeley and received a master's in fiction from Columbia. "My first stuff published was poetry," she says between bites of bagel, the first actual nourishment she's taken during her characteristically hyperbusy day. "My truest self is a second-rate published poet." But she says there's another side of her, reminiscent of Lisa Lubner, girl nerd. She grew up in Pasadena surrounded by the old breed of what she calls "New Deal Democrat techies," guys who worked in the aerospace industry and at Cal Tech, and she has always felt equally drawn to that world. Perhaps it is this outsider/insider dynamic that enabled her to have such a clear perspective of what was going on in Silicon Valley. She breaks technolibertarians up into two main groups. First there are the Ravers, neohippies who hope that "through the wonders of the Net we will all communicate and love one another ... without the repressive parental influence of nasty old governments to interfere in this freelovefest." At the other end you've got Gilders, so-called after the former Reagan speech writer George Gilder. They are superconservative specimens, "in love with the spirit of enterprise and the spirituality of the microchip." The book also discusses those poor suckers whose skills and natural endowments don't fit into "the shiny happy new information economy." This cyber-Darwinist theme appeared earlier this year in Borsook's How the Net Ruined San Francisco, a seminal article she wrote for Salon. In it she discusses how the new economy is forcing unmarketable artists and others out of a city that was once celebrated for its tolerance of freakdom. Borsook, a resident of Santa Cruz, sees somewhat the same thing happening here. "You're having the enclosures and the class wars happening in Santa Cruz like you had in San Francisco, but it's different. In San Francisco, you had a really rich, diverse, complicated urban environment become increasingly more like midtown Manhattan--sanitized and homogenized. But here you don't have an intense urban environment. I mean, we all know what Santa Cruz was. Here high-tech money and the dotcom speculative culture is turning Santa Cruz into another Carmel, a gated community for rich people." Paulina Borsook reads Wednesday (Aug. 9) at 7:30pm at the Capitola Book Cafe, 1475 41st Ave., Capitola. >From the August 2-9, 2000 issue of Metro Santa Cruz.